To have the Online Presence that you deserve, which is the one that showcases your best version and it's irresistible to your ideal clients, you need to follow 5 important steps. Finally have that professional and beautiful website that you've been dreaming about. I'll help you with clarity in regards to your brand, I'll also help you to create the content for your website, I'll really listen to your desires and outputs, I'll include you in the whole process and the final result will be a website better than your dreams. And the best part: all of that in a record time! 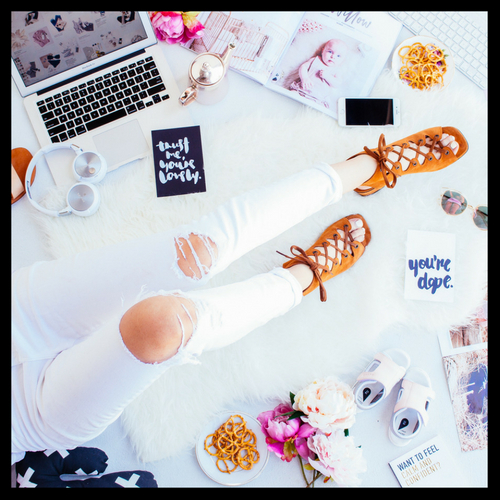 Grow your blog and/or social media with strategies that really work and that bring you long lasting results. I'll analyse your blog and each one of your social media and I'll provide you with personalised inputs to improve your performance. After working one-on-one with me, you'll be confident that you have a relevant online presence to reach any of your goals with it. Receive a loving honest full report about your online presence. You'll get many practical tips on how to improve your website and/or blog performance straight away and you'll also get strategies to be applied in a short, medium and long term. You'll receive the report as a PDF file via email up to a week after you've made the purchase. Hello! My name is Rosangela. I am here to help you create your epic online presence in a record time. Are you in? You know you're good at what you do. You know you can help people. Now you just need them to know it too. And what better way to showcase all your greatness than the Internet, right? But you need to do the right thing. Your online presence can either give you more credibility or to make you appear as an amateur. It can act as a pushing or as a pulling force to your clients. I'll make sure you get the first option and that your brand, website and online presence in general are absolutely irresistible to your ideal tribe.